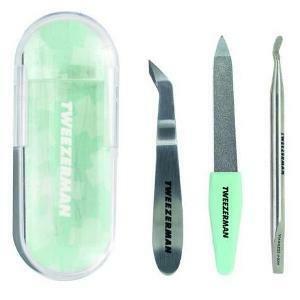 A portable trio of Tweezerman’s top stainless steel nail care essentials, our mini-kit provides big solutions for life's little problems: just pluck from your pocket or purse anytime your nails hit a snag and require a quick fix. 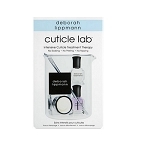 The petite, travel-friendly set includes three tools for complete nail care. Mini Cuticle & Hangnail Snipper — This revolutionary trimmer is designed ergonomically for easy, comfortable handling. The sharp, angled precision blades cut cleanly without pulling on skin — just squeeze to snip, that's it. Mini Cuticle Pusher & Nail Cleaner — Combined with a nail cleaner, our miniaturized famous Pushy® is buffed smooth to gently push back cuticles and clean under the nail. Mini Nail File w/ Green Handle — This nickel-plated mini file is super strong and long-lasting, with a sapphire finish for extra-gentle shaping and smoothing of nails.